A little over a year ago, I was researching the history of my hometown, Warrenton, VA, when I came across this article about Blind Tom. 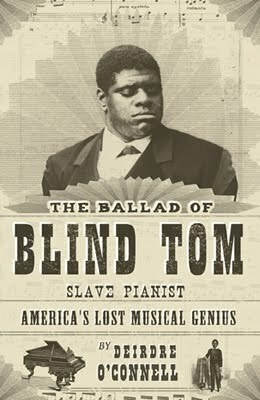 Black History Month is a befitting time to share the story of this extraordinary man who was born blind and autistic, but came to share with the world his phenomenal recall and musical genius. Thomas Greene Wiggins was born into slavery in 1849 and sold at auction a year later with his parents and two brothers to the Bethune plantation in Columbus, GA. Since Tom was blind, he was thrown into the sale as a freebie. Tom’s only sign of understanding anything was his interest in sounds and the ability to mimic them. According to Barbara Schmidt, she wrote in Archangels Unaware that General Bethune told Tom’s mother that her son had as much intelligence as the family dog and began teaching Tom animal commands like “sit” and “stand.” One day before Tom was six years old, he astounded the family by reproducing the sequence of chords from memory exactly as he had heard the Bethunes’ musically talented children play them.